A few weeks ago my kitchen clock broke. Actually not the clock itself did break. Instead, the clock face inside began to dissolve and fell into small pieces that hindered the hands from moving. I have no idea how that happened. It might have been the location in the kitchen above the window that includes exposure to fat and high humidity. Maybe it was a more general problem and it failed due to its age. This clock must be in my household for more than nine years now. I pondered getting a new clock. However, I could not easily find one that both matched my expectations in price and design. Anyway, the clockwork itself is still functioning as it should and the rest of the plastic housing is also fine. 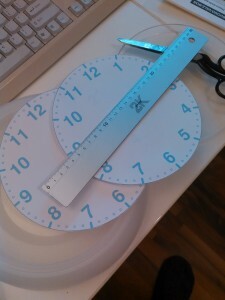 Therefore, I decided to breath new life into this one by designing and printing a new clock face. This entry was posted in English, Hardware, Making and tagged clock, clock face, hardware, kitchen, making, tinkering on 2016-03-28 by Rainer Müller.